It’s tough to talk about a periphery without first talking about a center. I’m not planning to be too terribly strict with my definition of the “periphery” of the city over the course of my time in Mexico City; after all, with every traffic jam and with every bus delay, the mental distances within a city yawn wider. When your train is delayed, it’s easy to feel on the margins, and (with investment in infrastructure, anyway) it’s easy to feel connected as well. In any case, I’ll come to the topic of delineating the extents of the city, the reaches that are the subject of the project. That’s the hard question. Spotting the center of the city–in many ways the center of the country– is strangely simple. The Zocalo, formally the Plaza de la Constitution, is bounded by buildings housing the center of the Catholic church in the city, the country’s Federal Government, and the government of the Federal District. A massive expanse of volcanic stone, a plaza that can hold 100,000 people, the Zocalo is the center of the Centro Histórico, the historic core of the city and, by tradition, its heart. Political and religious powers are given architectural form here in 2014, as they were in Pre-Hispanic times, when the space was the center of Tenochtitlán, the capital of the Mexica people that give the city and country its name, though in English we usually refer to them as the Aztecs. Legend holds that in 1325, then-traveling Aztecs saw an eagle land on a nopal cactus, with a snake in its mouth, on an island in Lake Texcoco—the body of water that then spilled over much of the Valle de Mexico. Able to engineer a way to expand the limited dry land in the center of the lake, the Aztecs eventually came to build a city, Tenochtitlán; it would eventually be home to over 200,000 people living around a central space of governance and worship that was sited, more or less, exactly where the Zocalo now sits. Not coincidentally, of course: shortly after Cortez arrived to the city in 1519, he had the Aztec temple demolished and a Catholic church built atop, with the seat of Spanish government in the New World to be built next door from the materials of Aztec ruler’s palace. Even when the Spanish rulers were removed from the country at the close of the War of Independence, in 1821, that same building was pressed into service as the seat of the nascent government, and it still, as the Palacio Nacional, is the seat of the Mexican government. 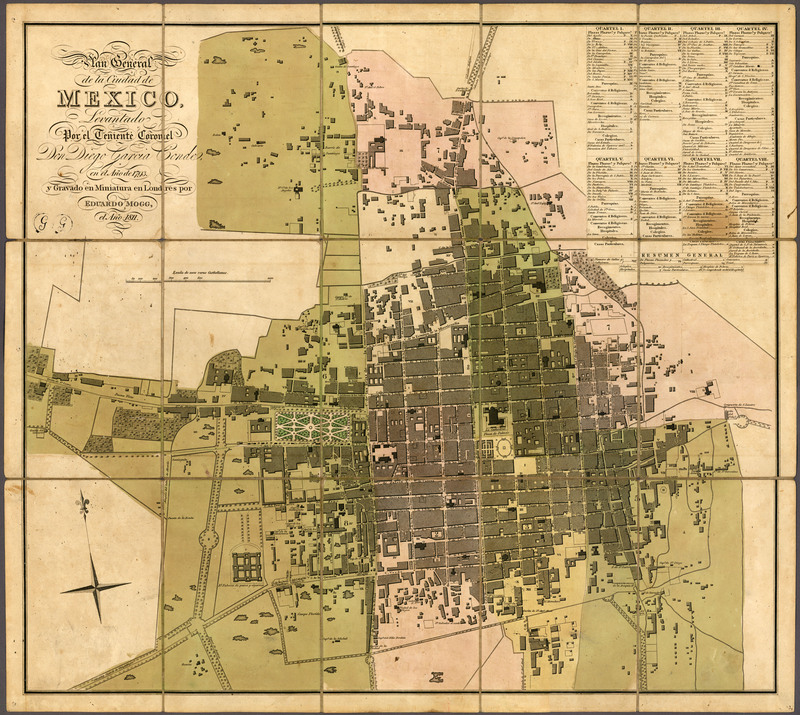 There were other ancient sites—some, cities in their own right—that are now utterly enveloped by the city: Coyoacan, Iztapalapa, Mixcoac, to name only a few. These were mostly sited on the shores of the lake that Tenochtitlán had taken as its domain, and in a strange way, then, perhaps it’s possible to think of the extents of the ancient, now long-gone Lake Texcoco as having formed a natural border of the city. While Tenochtitlán occupied an artificial island that covered more or less what is now the colonia Centro, around 9 square kilometers, the lake is now nearly vanished, with its now-drained beds hosting millions of residents. (I’ll return to the point later in my project, but this causes problems. I blame the eagle). The centro is endlessly interesting, and it’s really a shame, almost, for me to leave it out of my investigation of the city. It’s fascinating not only for its vast ensemble of historic structures, which bring the tourists, but also for its endless and specific markets, for everything from second hand cellphones to quinceañera dresses, to lighting fixtures, all of which daily bring countless thousands of shoppers from around the city. The centro is served by several of the city’s most crucial metro lines, which allow it to become flooded, quickly, by protestors and window shoppers alike. That’s all to say that, in many ways, the city is still unipolar; millions of lives are lived focused in on its centuries-old heart. Commerce still happens here–including one of its most notorious informal markets. Cultural institutions still abound. Power still resides here. The symbolic weight of the Zocalo is unmatched. In the wake of the tragic and disgusting actions in Guerrero that have more or less coincided with my time in Mexico, hundreds of thousands have marched on the Zocalo to be heard. Just a week ago, the doors of the Palacio Nacional were burned by protesters spurred by the same energy. The Centro is where accountability is demanded, where people have gathered for centuries, and where you can buy pipe fittings. It’s a small world unto itself, one you can walk through in about half an hour. And yet, as I mean to demonstrate throughout my time here. It’s certainly not the only center of the city. From the time that the Conquistadores began to drain the lakes around Tenochtitlán, the city has expanded. When, in the 19th century, a French-dominated empire planned its own Champs-Elysees—the Paseo de la Reforma—political power radiated away, if temporarily. The skyscrapers that line Reforma today mark the more dramatic departure of economic power from the Centro, a process which yet continues. In turn, when the Metro opened at the close of the 1960s, average people began to live further and further away, while private car ownership and expanded informal transit have allowed for the creation of more separated districts, like the transit-poor Santa Fe, or Chalco. Faster and faster, the city has been unspooling itself. No longer is the Centro the place where the majority of the city’s living, working, and shopping takes place–though certainly people continue to do all three there, perhaps in greater numbers and with greater mixture than the historic core of any city in the U.S. that I can think of. Though it remains fascinating, and ever-changing, it is in following this trend of multipolarity that I’m planning to search out the contemporary heart(s) of the city from the outside in. As always, I’m more active on my instagram (@michaelwaldrep) than here, though I hope to keep the blog updated more regularly going forward. And as always, thanks for following along.